John Francis Carreri was born in Mantua, in the late fourteenth century. He grew up a silent and prayerful child, a good student and a great reader. These qualities seemed to recommend him to the Preaching Friars, and at an early age, he presented himself at the convent in his home city and received the habit. Matthews’s career as a preacher began soon after his ordination, when was sent to Lombardy to preach against the heretics. He succeeded admirably in his preaching and converted many to a spiritual way of life. 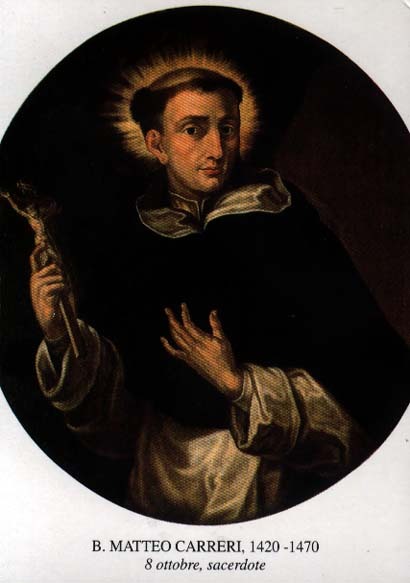 Traveling from convent to convent he preached a revival of fervor and a deeper understanding of the spirit of St. Dominic, and many of the religious of Lombardy-both Dominicans and members of other Orders- were led by him to become more fervent. At on time, when he was preaching in Vigevano, a troupe of jugglers came into town and set up their act. They were a particularly scandalous set of people, poking ridicule at the religious and the pope. Matthew sent them word to move on, which they ignored. So went after the with his walking-stick, and this proved more effective. They scattered and ran but soon came back , fortified with the presence of the Duke of Milan, who scolded Matthew for being so narrow-minded and humorless. Matthew patiently pointed out to him the bad spots in their humor, and, in spite of the duke’s natural aversion to friars, convinced him that he should keep the jugglers out of town. At Lucina, there was a lady of noble birth and great talents who was wasting her time in frivolities. Never one to avoid an issue, Matthew aimed a powerful sermon in her direction, and she came to him afterwards in a torrent of tears and begged him to help her. He gave her the habit of the Third Order and outlined a stiff rule of life, which she afterwards faithfully followed. He also met and directed Blessed Stephanie Quinzan who proved to be an apt pupil. Matthew was given the job of reforming the convents of the friars in Soncino, and in nearby towns, and he worked for many years in Milan. Going up and down the peninsula, he varied his approach but never his message: penance and love of God. So many were the conversions effected that a whole group of follow-up preachers had to be appointed to carry on, as he moved rapidly from place to place. Preaching his way, went through Tuscany, and took ship at Genoa. The ship was soon captured by a Turkish corsair. The Mohammed captain called on the three Dominicans for an explanation of why they were there. Matthew spoke up so fearlessly and eloquently that the captain released all three of them. Just as they were being hustled off to a rescue boat, the wail of one of the woman passengers stopped them. The lady and her young daughter were not anxious to be taken to Algiers, and Matthew began pleading for them. The captain told him he had better let the affair alone and be satisfied that he has saved his own skin. Matthew thereupon volunteered to go to Algiers, in chains, if the captain would release the two women. Amazed at his courage as well as at his brashness, the captain released all of them and told them to get out of his ship quickly before he changed his mind. Many miracles are credited to Matthew Carreri. One day, a young father who came to hear Matthew preach, had left his little son at home with the nurse. the baby fell into the fire and was badly burned. The distracted father brought the little one to Matthew, who cured him. the baby was well in a few days, and grew up to be a Franciscan friar. Matthew cured another man of hemorrhage, and worked many cures on the sick and possessed. One day, , while meditating on the Passion, Matthew asked our Lord tp partake of His sufferings. He received the stigmata, in the form of an arrow that pierced his heart. For the remainder of his life, he suffered great pain from his wound. Matthew Carreri died, in 1470, in a house composed entirely of religious he had rescued from a life a laxity. His cult was confirmed twelve years after his death, testifying to the great reputation for sanctity he enjoyed among the people of northern Italy.